In 1950, plant physiologist and bioethicist Arthur Galston experimented with a molecule called dioxin, which he thought would help soybeans grow better. 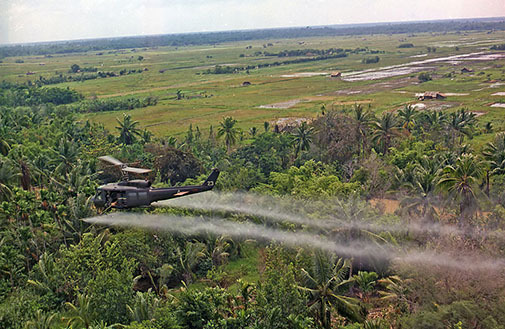 Later on, others built on his research to produce Agent Orange—a toxic chemical used during the Vietnam War that caused long-term damage to people and environments exposed to it. This example illustrates an important point: Scientists and inventors cannot always predict how their work will be used or applied later on. On occasion, however, scientists like Galston do speak out if they notice what they consider to be an abuse or misuse of science or scientific research. Recently, researchers at the University of North Carolina created a metal foam that pulverizes bullets that strike it. This material has enormous potential. What could metal foam be used for? What responsibility, if any, do scientists and the public have to make sure new technologies are developed for the purpose of good? How do we decide what qualifies as “good”? See the Educator’s Toolbox below for a student worksheet (DOC & PDF) and audio transcript. What are some common uses for metal? How do we improve the strength of metal? Is there a relationship between the mass of a structure and its strength? What are some common uses for foam? Reading: Groetzinger, Kate. “Researchers Have Invented a New Type of Metal That Pulverizes Bullets.” Quartz, 20 Apr. 2016. Reading: Kornei, Katherine. “New Aluminum ‘Foam’ Makes Trains Stronger, Lighter, and Safer.” Wired.com. 14 Dec. 2014. Reading: Micu, Exandru. “This New Metal Foam Is Strong Enough to Turn Bullets into Dust.” Science Alert, 6 Apr. 2016. GENERATE IDEAS: Professor Afsaneh Rabiei talked about four possible applications for this metal foam, including body armor, car bumpers, and trains. With your group, discuss other possible applications for this technology. Does the potential good of metal foam outweigh the possibility that it could be used in a way that is harmful or negative? Do scientists and the public have an ethical responsibility to make sure technologies like metal foam are used in a way that protects instead of harms living things? Why or why not? GENERATE IDEAS: How would you ensure the positive use of a technology? What would you do to stave off potential harmful applications? How would your plan be enforced? Who would you involve? Professor Afsaneh Rabiei stated that she “…originally started making this material, not necessarily for armors, but more for cars and trains….” This metal foam technology has a wide array of possible uses. Should scientists and the public be allowed to limit who can use this technology and how it can be used? — State whether the student agrees or disagrees and provide a claim statement. — Support that claim with reasoning and evidence. — Incorporate evidence from the media. Have students debate the issue. Their arguments should be supported by both historical and ethical arguments. Here are guides from the International Debate Education Association (IDEA). CCSS.ELA-LITERACY.W.9-10.1, CCSS.ELA-LITERACY.W.11-12.1: Write arguments to support claims in an analysis of substantive topics or texts, using valid reasoning and relevant and sufficient evidence.